Iron is one of the most abundant minerals on earth, and we depend on it to live. Nonetheless, as much as 80 percent of the world's population may have an iron deficiency. Slow-release iron supplements are a viable solution to low blood iron, but iron supplements can also be dangerous. Always consult a medical professional before taking slow-release iron supplements. Slow-release iron is a dietary supplement. It comes in the form of a pill or tablet, which is taken orally. The supplement provides your body with ferrous sulfate, released slowly over a period of time. Because the iron is released gradually, people who require multiple doses throughout the day can take less potent supplements, and do so less frequently, than with regular-release iron. Iron is a mineral your body needs to function. Without iron, you can't produce enough red blood cells to stay healthy. This can lead to tiredness, shortness of breath and weakness, among other things. Iron deficiency anemia is a recurring or ongoing condition of low blood iron, and the most likely reason for people to take iron supplements. 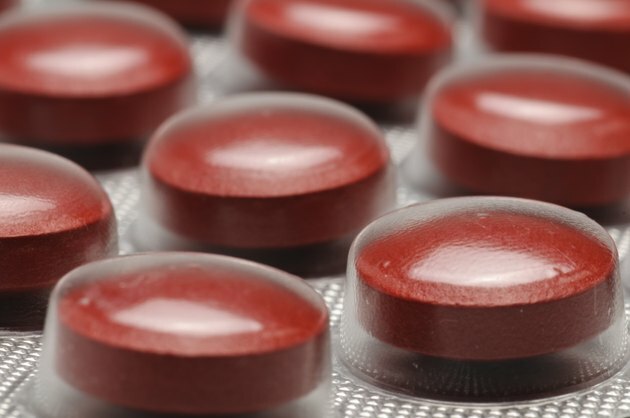 Anemic people may need to take a 160 milligrams extended-release iron supplement once or twice a day for several weeks or months until their blood iron levels stabilize. Slow-release iron is not usually recommended for pregnant women or children, who are more likely to take regular-release supplements. Aside from its benefit to anemic patients, slow-release iron can be effective for people with restricted or unhealthy diets. In particular, vegetarians and vegans may need to take iron supplementation. According to the National Institutes of Health, the iron in meat and animal products is easily absorbed by the body, but iron in non-animal products is less consistently absorbed and can be blocked by certain foods, including tea, legumes and grains. People who have limited access to nutritionally balanced foods, or who eat too much unhealthy food, can also benefit from iron supplements. Foods like soda, desserts, potato chips and other "junk foods" are cheap and high in calories but low in nutrition. People who survive mostly on these types of foods can be at risk for deficiency of many vitamins and minerals, including iron. This includes older adults as well as children and adolescents. Slow-release iron is considered safe to take on an empty stomach, though it may cause some irritation. This usually manifests as heartburn, nausea or vomiting, as well as black or green stools. In these cases, you may take iron supplements with food. More serious side effects include diarrhea, stomach pain, constipation, chest pain or dark urine. Side effects of slow-release iron are usually related to the size of dose you're taking. Talk to your doctor before starting regular iron supplementation, and if you experience side effects. It is possible to overdose on iron. This is most common among adult men and postmenopausal women, who do not generally require iron supplementation. It's also dangerous for children. Keep iron supplements away from children, and never exceed the recommended dose. An overdose can cause heart palpitations, shallow breathing and other symptoms. Taking too much iron over time can endanger organ function, and possibly cause heart attacks. Slow-release iron capsules can interact with doxycycline, mycophenolate, penicillamine and thyroid hormones. If you are taking any of these medications, a slow-release iron supplement may reduce their effectiveness. Talk to your doctor for more information. The University of Maryland Medical Center suggests that you also avoid antacids while taking an iron supplement, and let your doctor know if you actively take an antacid.